Getting to the Druid Stones is definitely an uplifting experience. The hike climbs about 1,700 feet in a little under 2 miles and delivers a bird’s eye view of Bishop and the Owens Valley below. 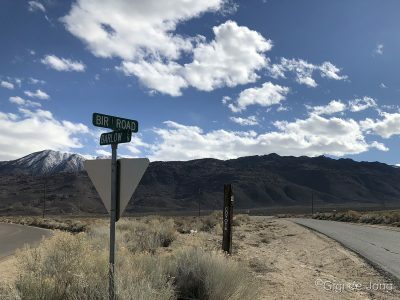 The hike follows a fairly obvious trail from the base of the Coyote Ridge just off Bir Road, about 5 miles southwest from the center of Bishop. There are a few pretty steep sections, so wear your good shoes, or bring hiking poles for balance. The Druid Stones area is another well-liked spot for bouldering, but not as often frequented by climbers because of the relatively long (by climbers’ standards) and steep ascent. This is super trail that delivers a short (by hikers’ standards) and strenuous hike with quick and easy access to the trailhead. It will warm you up well on a chilly winter day. Once on the plateau you’ll have an incredible view and it’s likely you’ll find solitude to sit and contemplate the world. In summer this is a great bouldering spot for climbers to escape the hotter temps of the valley below. Hikers with a good level of fitness will find this is a great way to stay in shape for longer, high altitude hikes. The Druids Trail is wonderful for runners to improve endurance and running techniques on steep ascents and descents. All in all – it is for outdoor enthusiasts with moderate to good fitness and some experience at higher altitude hiking. Your youthful, energetic dog will love this trail too. It is accessible and wonderful all year, but best between April and September. Mid-winter can drop a good number inches or maybe even a foot or so of snow up higher which will impede safe travel. A sunset hike in summer – especially on a full moon night – will be magical and you could find your way down by the light of the moon. Follow W. Line St. (State Route 168) west from the center of Bishop to the traffic light at Barlow Rd. Turn left (south) and travel until you pass beyond the developed neighborhood until you reach a fork in the road. Take the right hand fork, Bir Rd., and drive slowly for 1.7 miles. Turn left onto a dirt road toward the trailhead parking at the base of the hill. Park in a suitable clearing off the main road or dirt road and please do not crush the brush. As always when hiking in the Eastern Sierra be prepared with layers of clothing (especially wind and waterproof layers if the weather is inclement), plenty of water, a hat and sunscreen (even in winter), and snacks.